At CPAC, recently, an estimated 10,000 conservatives and libertarians, together with many presidential aspirants, gathered across the Potomac. They did so amidst massive hoopla and intense media fascination. We in the media are nothing if not suckers for hoopla. History, however, typically emerges without hoopla. Janet Yellen, meeting with 21 members of the center right, in Washington, at the very same time, may actually have made some real history. While this story was reported by the AP (as carried, among many publications, by the New York Times, ABC, Fox Business, and Salon.com), the Wall Street Journal, Bloomberg, CNN, the Washington Examiner, and the Daily Signal, among others, there is more to report. On February 27th, at the Fed headquarters at the corner of 20th and Constitution, the Chair of the Federal Reserve Board of Governors, Dr. Janet Yellen, and Governor Lail Brainard, met with a delegation of 21 center right figures. The delegation included some of the most influential free market thought leaders from the monetary and financial policy arena. A dozen attendees made thoughtful statements. The rest, myself included, were present as observers. The ground rules of the meeting prohibit any characterization of the statements of Fed officials by participants. It does not, however, violate the ground rules to report that Chair Yellen and Governor Brainard were keenly attentive, well focused on each speaker, and presented respectful and intelligent questions to ensure they fully understood the statements made. The delegation was assembled and led by the Hon. Steve Lonegan, monetary policy director of American Principles in Action. It included four other representatives from APIA: its chairman, Sean Fieler; APIA director and board secretary Ellen Barrosse; Dr. Marc Miles, an APIA consultant; and myself, APIA’s senior economic advisor. Among the thought leaders were Cato Institute president (and former BB&T CEO) John Allison; economic historian Prof. Brian Domitrovic;Heritage Foundation economist Dr. Norbert Michel; and Atlas Network’s Dr. Judy Shelton. Lonegan’s, and the delegation’s, core theme: liberals do not have a monopoly on caring about middle and low-income wage earners. This theme represents an authentic, and welcome, shift in the right’s discourse. It represents a shift away from (although not inconsistent with) a utilitarian theme to a humanitarian one. A new, unified, message by the right, at the Fed, was unmuffled: a free market strongly benefits workers. This message to Yellen may prove a watershed shift by the right. Could prove historic. While the Fed’s intentions are good, the current policies are leading to distortions that are hurting middle and low-income workers. This is not the Fed’s desired outcome. Our scholars will present evidence to that end and will be punctuated by representatives … who will give personal testimony. It is our desire to produce thoughtful and valuable research to Fed officials. Over the forty some years since 1971, two sets of two decades mirror each other. The 1970s and the (now long) 2000s have proven eras of monetary discretion, and the 1980s and 1990s were those of classical policy, classical de facto if not de jure. Moreover, just as the 1970s and the 2000s are like to each other in being less classical in monetary orientation, so did the 1980s and 1990s jointly recall the decades of Bretton Woods: both of these eras were more classical in monetary orientation. Economically, the effects were startling in their contrasts. In the 1980s and 1990s, growth was high, recessions rare (there was one from 1982 to 2000), entrepreneurialism common, and jobs abundant. In the 1970s and the 2000s (through today), recessions were either frequent or their recoveries slow and shallow, un- and under-employment sampled new high levels, and investment went into primary inputs ranging from oil to land (and gold) to an uncommon degree. John Allison spoke eloquently of how the Fed’s new regulatory rules functionally disable community bankers from making loans on the basis of good judgment about the character of borrowers and of the social fabric of their communities, a depth of judgment which had enabled safe lending and the creation of new businesses and abundant new, good, jobs. Dr. Norbert Michel, drawing upon the Bank of England’s 2011 seminal Financial Stability Paper No. 13, observed that under the post-1971 fiduciary monetary regime annual GDP growth has been a full percentage point lower; annual average inflation has been materially higher; downturns in median countries have more than tripled; banking crises have moved from one per decade to 2.5 per year; and the number of currency crises has doubled. Against a range of economic metrics, the world’s major economies have performed more poorly since the breakdown of Bretton Woods. … There is enough evidence for the Federal Reserve Board of Governors, at the very least, to passively support the bipartisan Centennial Monetary Commission. Such a Commission, which would include a [representative] appointed by the Fed Chair, would fully evaluate economic performance under alternative monetary regimes. Dr. Miles requested his presentation be kept off the record by this columnist. That request hereby is honored. Sean Fieler closed with a reiteration of Dr. Michel’s call for Fed support of a monetary commission as a way to legitimize the discourse and create a space for a national conversation. Fieler stated the desire to help foment a fruitful discussion. In that spirit, he informed the Fed of APIA’s scheduling its own Jackson Hole symposium, overlapping that of the Kansas City Fed, next August, and announced that this symposium would feature former Fed Chairman Alan Greenspan. The center-right delegation also included activists and members of the rank-and-file public telling their life stories about hardships inflicted by the contemporary economy. Herman Jung, Selina Stinson, Sue-Ann Penna, and Matt DeVries told their personal stories. Jim Martin, president of the 60 Plus Association, spoke on behalf of seniors and Jiesi Zhao, director of the Young America’s Foundation’s Center for Entrepreneurship, spoke on behalf of Millennials. Also present were Phil Kerpen, of American Commitment, Peter Sepp, president of theNational Taxpayers Union, Deneen Borelli, Outreach Director for FreedomWorks, Richard Lowrie, Senior Advisor for Put Growth First, and Varditra Reid, a working single mother. 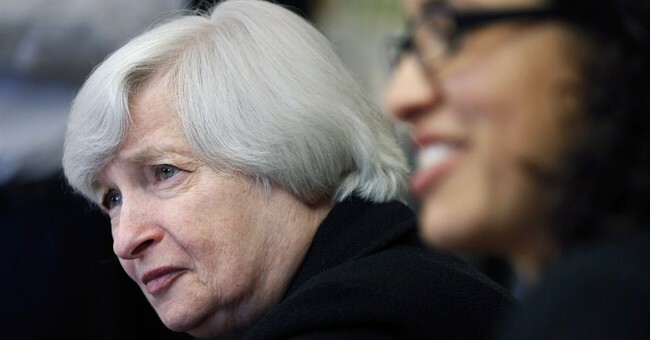 Fed Chair Janet Yellen and Governor Lail Brainard listened respectfully throughout the hour’s presentation. Dr. Yellen has set a new tone for the Fed, breaking many of its hermetic seals the better both to speaking and listen. Dr. Yellen, by extending the same courtesy to the right as she has to the left, is proving instrumental in elevating the national conversation about monetary policy. It is too much to ask “even of officials of such admirable integrity, intellect, and heart as Janet Yellen (and Chair Yellen’s deeply admirable Vice Chair Stanley Fischer…. )” as I previously have characterized the current Fed leadership, to do this unaided. Time for a national conversation. As Dr. Yellen made clear to Chairman Jeb Hensarling in her most recent testimony before the House Financial Services Committee the Fed desires independence, not autarchy. Now it is time for a sympathetic Congress, one respectful of the high value of Fed independence, to engage. Time to take the national conversation to the next level by enacting a national monetary commission to evaluate empirically, in a nonpartisan fashion, what monetary policies have proven, in practice, most beneficial in the creation of a climate of equitable prosperity, job creation, and income mobility. Next let the presidential contenders — of both parties — join this national conversation. Let the presidential aspirants respectfully place the importance of good money in the creation of full employment — and how best to get to good money — into the very center of the upcoming presidential debate. Good money is key to abundant job creation.